• Scientists from the EU-funded Scent research project have developed two new gaming apps, Scent Explore and Scent Measure, to monitor changes in the environment in flood-prone regions. • Scent Explore enables citizens to monitor river parameters, such as water level and velocity, and Scent Measure measures soil moisture and air temperature – helping to improve the accuracy of land use/land cover maps and flood models. • Scent is looking for volunteers to test the new apps in the flood-prone region of Attica, Greece between 15 and 18 November 2018. • Become a ‘citizen scientist’, visit the beautiful areas near the Kifissos river and make your contribution towards the protection of the local environment by taking part in the pilot testing of the Scent project. Register here. European scientists have developed two new environmental gaming applications as part of the EUfunded research project Scent, and are now looking for volunteers to test these apps. The apps are called ‘Scent Explore’ and ‘Scent Measure’, and they enable citizens to monitor changes in their local environment and help scientists understand how these changes affect flooding. To start playing – download the apps to your smartphone or tablet and use the augmented reality function of ‘Scent Explore’ to find the hidden Scent creatures in your locality. Scent creatures are hidden at specific points of environmental interest where collecting data is important for understanding flooding in the region. Players earn points by taking a photo or short video of these creatures using the ‘Scent Explore’ app, while at the same time capturing valuable information about river parameters, such as water level and velocity. When prompted, players can also capture Scent creatures using the new ‘Scent Measure’ app to measure soil moisture and air temperature. Simply insert the smart portable sensor into the soil, select whether to measure temperature or moisture, and receive the measures directly to your smartphone device. “This is the second Scent pilot campaign organised in the Attica region and specifically at the Kifisos river basin, by the Greek partners of the project. However, it will be the first time for volunteers to test the ‘Scent Measure’ app, developed by ICCS for the purposes of the Scent project, and the water level and velocity measurement features of the ‘Scent Explore’ app. 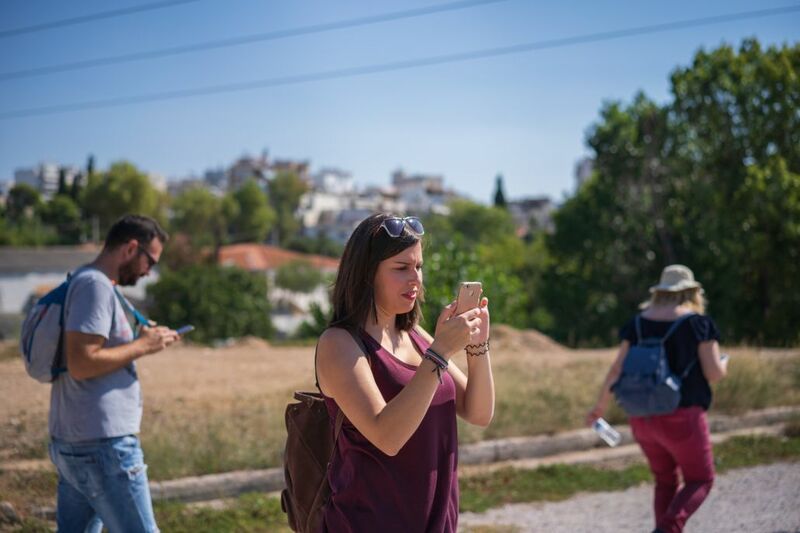 The basic aim of the Scent pilot campaigns in Attica is to collect valuable environmental data related to the flood phenomena that affect the region, with the active participation of volunteers,” said Dr. Angelos Amditis, Scent Project Coordinator and Research Director at the Institute of Communications and Computer Systems in Athens. “Scent applications are an easy and low-cost method of facilitating regular people in becoming ‘citizen scientists’. All the data generated by the ‘citizen scientists’ through the apps provides real-time information used to complement other data sources, such as satellite images, as well as to enhance the accuracy of existing land cover/use maps and flood models. Our goal is also to investigate how such ‘citizen observatories’ may help make areas close to flood plains less vulnerable to disasters. We believe that if we are more informed about the changes in our surroundings, we can better help the relevant actors and authorities to make more informed decisions about environmental protection and flood management “he added. Scent scientists are now looking for volunteers to test ‘Scent Measure’ and ‘Scent Explore’ in Kokkinos Mylos, New Philadelphia, Dhekelia and Varibobi areas in the Attica region of Greece, between 15 and 18 November 2018. By joining the Scent campaign you will learn new skills, work with similar thinking people, while collecting data about the changes in the land cover and land use, the river parameters as well as measurements about the air temperature and the soil moisture. Citizen scientists will meet each day at 10am in the Auditorium of the General Directorate of Transport and Communications of the Region on Attica, (156 Mesogeion Str., Holargos) to attend a training seminar before heading into the field. To take part all you need to do is download ‘Scent Explore’ and ‘Scent Measure’ apps to your smartphone, select your preferred date and register your details here. For more information about the Scent project, please visit www.scent-project.eu.